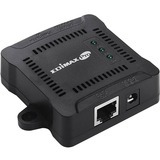 The GP-101ST Gigabit PoE (Power over Ethernet) Splitter delivers both data and electrical power to non-PoE Fast Ethernet or Gigabit Ethernet-enabled products such as network cameras and wireless access points, using an Ethernet cable and without deploying power outlets and electrical cabling. Ideal for remote locations, the GP-101ST allows data transfer between the PSE (Power Source Equipment) and GP-101ST up to Gigabit speeds and delivers power output voltages of 12V, 9V or 5V DC simultaneously up to 100 meters (328 feet). The GP-101ST is easy to install and requires no tools or software, while offering the benefits of cost savings as well as flexible network planning and high reliability. The GP-101ST supports 802.3at/af and proprietary PoE, ensuring compatibility with other 802.3at/af PoE/proprietary-compliant injectors and switches. The GP-101ST is easy to install and requires no tools or software configuration. Just connect the GP-101ST device to any power source device such as a PoE injector unit or a PoE switch to provide power to Ethernet-enabled devices. The GP-101ST offers small to medium business a complete end-to-end PoE solution. The GP-101ST supports 802.3at/af ensuring compatibility with other 802.3af PoE compliant injectors or PoE switches. Taking the convenience of PoE, the GP-101ST eliminates the need and costs to place an Ethernet-enabled device such as a wireless access point or a network camera near a power outlet or deploy electrical cabling. For flexible network deployment options, the compact-sized GP-101ST can be mounted on a ceiling or wall up to 100 meters (328 feet) from a power source. The GP-101ST features PoE short circuit protection to safeguard network devices and supports 5V, 9V or 12V DC output with a built-in slide switch to select the power output according to the requirements of your network device.